Haitians have survived in a geopolitical environment that has been undeniably hostile to them from the day they voiced their desire to live free in a sovereign nation and ever since. Notwithstanding, they have created a startlingly different way of life, a unique signature of Religion, Arts, Language, and above all a sense of identity deeply rooted in spirituality and collective remembrances. We aim to present you some interesting windows on Haiti's culture. True exploration begins when you venture beyond them and engage in respectful contact and discovery. This web site has emerged as a labor of love for my native country. As such, I dedicate it to her friends and children, the painters and the poets, the researchers and the students, the drummers and the dancers, the musicians and the storytellers; to all participants in and contributors to the uplifting aspects of her culture; to the unsung heroes; to the makandals, the boukmans, the peraltes; to the marie-jeannes and the madan-saras; to the gwo-zoteys and the restaveks, the illiterate and the famished. From the bottom of my heart, I thank my family for allowing me to spend an inestimable amount of time and resources on this endeavour. My name is Guy S. Antoine. 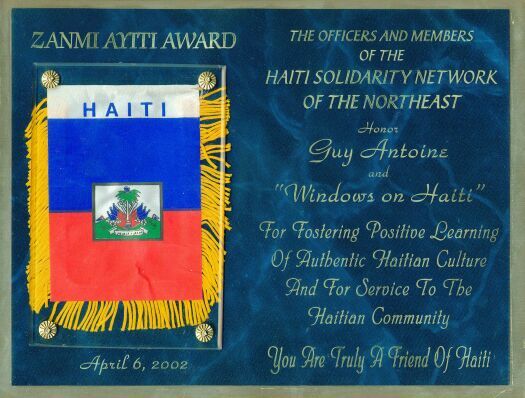 Windows on Haiti has been my voice since April 20, 1998. I sing of my love for Haiti, and though my voice is feeble, I will keep practicing and making it stronger as I go along. To state my views in the simplest way, I am against social barriers, let it be racism, sexism, class prejudice, or misplaced nationalism. In Haiti, our vaunted nationalism translates into pride in our History and total neglect of the Present. We were the first enslaved people to fight successfully for freedom and national independence. Yet today, we receive our dictates from abroad and we are at the international lending institutions' mercy. Worse yet, many of us live in conditions of modern slavery, strangely reminiscent of old: in the "bateyes" of the Dominican Republic, and in the homes of our cities, which are populated with "restaveks". Just where is Toussaint Louverture for them today? At the start of the most recent, disastrously implemented US/UN embargo against Haiti, a middle-class youth in Haiti was asked if he was worried. He responded casually: "Sak pou manje ap toujou manje!" (Those who should eat will eat no matter what!) In this one statement, he betrayed the tragedy of the Haitian people. Haiti will never again be a great country, until we treat all her people as our brothers and sisters, deserving the same opportunities that many of us take for granted due to fortunate but accidental circumstances. In colonial times, Haiti was a country with entrenched social divisions: classes of grands blancs, petits blancs, affranchis, and slaves. 1804 was supposed to have done away with all of that. As we near 2004, are we closer to a unified people than we were back then? Barely 19, I came to the United States to pursue university studies. Now I have reached middle-age and have long ago become a U.S. citizen, a route which affords the privilege of voting one's individual and group interests where one actually resides. In my heart, however, I will always be Haitian. I want my children to learn everything about the culture of their Haitian ancestors. I have retraced for them my vast family tree, going all the way back to a slave named Chicotte. I teach them about the Haiti I know every chance I get, but in the end I want them to make their own choices and grow up to become productive and compassionate human beings in whatever corner of the world they may choose to live in. That's the story of many of my peers, friends, and relatives. Not all, as some have chosen to go back, at great personal sacrifice. For the most part, we were raised to leave Haiti behind, if not explicitly yet subconsciously, in a relentless and powerful way. Now, when I go back to Haiti, after the first few minutes of exhilaration at the airport on setting foot on the soil that gave me birth and breathing the air that invigorated my unforgettable youth, reality sets in. A reality that is as inscrutable as ever. A reality that begs for answers to these questions: Why would a people do this to itself? Why do foreigners seem more interested in saving Haiti than Haitians in Haiti? What role does the vast Haitian Diaspora have to play in all of this? One thing for sure, today I am a Haitian-American. Whatever that means, it is precisely what I make of it through my personal choices which are dictated by values and not rigid ideology. I hope that my actions as a Haitian-American, in tandem with those of my friends all over the world, and specifically Haitians in Haiti, will help close the circle one day: Haiti has undeniably given so much of her blood, tears, and guts to the world, we must never lose hope that one day those riches in human and material terms will come back to re-energize her. Perhaps one day, we will stop referring to her (shamelessly) as "the poorest country in the Western Hemisphere", shaking our heads in disbelief at her abject misery. No country that has given so much could be intrinsically the poorest country. We have to change the forces that shape the exodus of her people and her riches. We have to fulfill our mission to become one people. Let us please stop saying vainly: "L'Union Fait La Force", while stabbing each other in the back. Let us instead act on that worthy principle in our personal lives and in our national life. Only then will the circle close. My objective is precisely that: to help close the circle. I invite you to join me in good faith and for the good of Haiti. Listen to your inner voice and reach out. Haiti needs all of us. "Annou koupe tèt enjistis, boule kay lamizè"